The Peace of Mind Home DNA Paternity Test from Ormond Quay Paternity Services will resolve any worries or concerns you may have over the paternity of your child. The test is very easy to conduct and can be performed in the comfort and privacy of your own home. Once we have received your DNA Samples we will analyse them for 4 working days where upon the test results are sent to you. Are you unsure of the Paternity of your Child? Paternity testing works by comparing the DNA of a child with that of the alleged father and the mother. A child inherits half of their DNA from each parent, a Paternity test reveals whether or not half the child is related to the Alleged Father who has donated his sample. The accuracy level of this test is far in excess of 99.999% so you can rest assured the results we produce are accurate. If you have question about DNA testing or wish to purchase a Peace of Mind Home DNA Paternity Test Kit feel free to contact our office on 01 487 77 94 or purchase online. 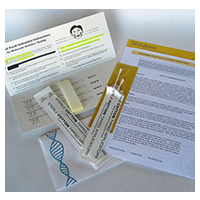 Once payment has been received your Peace of Mind Home DNA Paternity Test Kit will be sent to you immediately. Orders placed outside business hours will be sent the next working day. Sample Statement and Consent Form: Name, address, phone number of Alleged Father, Mother and Child must be written on to the sampler statement form. All parties undertaking the test must sign and consent for their DNA to be taken and analysed. Please note that Mother’s Consent will be required for all children under the age of 16. We are only able to test a child with no consent from the mother if that child is over the age of 16, the mother is deceased, or is being exclusively cared for by the alleged father or social services. In all of these instances we require documentation proving same. Buccal swabs: These swabs are placed in the mouth and collect Cheek Cell DNA and are placed in colour coded DNA Sample envelopes. Instructions: Step by step instructions on how to perform your Test. Pre Addressed Envelope: We provide a pre addressed padded envelope to post your samples to our laboratory. Please note you are required to pay postage and we strongly recommend you send the samples by registered post or recorded delivery. Identification: It is required that all parties undertaking A DNA test send back with their samples a copy of their passport or driving licence. If the child does not have a passport a copy of their Birth Certificate will suffice. Once you have completed the test. Place everything in the addressed envelope, and post to our laboratory by Registered Post where the DNA Test result is produced. The laboratory analyses the samples for 4 working days. In total from ordering your test kit to receiving your results takes anywhere from 5-12 working days. We strongly urge you to collect your DNA samples as soon as you receive the test kit and send the samples back to us immediately. Please note that this test is not a court approved service and cannot be used for official purposes such as changing a birth cert or immigration matters. We recommend that customers who simply want to confirm paternity and do not require anything else purchase this test. If there is a chance that the test result will be required for official or legal purposes we would strongly recommend that customer purchase the Legal DNA test. While the legal DNA test is more expensive it is prudent to pursue this option if appropriate.